When the idea of a Para Paints Blog Crew Spring Fever Challenge was hatched I must admit to being a bit hesitant - I mean what would I paint? Sure, I still live in a condo with all white walls but, while I have vague ideas of what I want to do with the rooms, with school and work I simply haven't had the chance to sit down and really figure out what colour(s) to use. I wish I was one of those people who can pick a colour out of a fan deck and immediately know that it's the perfect colour for the space. I take a while pondering and second guessing myself and I didn't have that much time for this project. Anyways, once I committed (along with Meredith and Susan of Newberry Sykes, Tash and Kes from The Dream House Project, Sabrina from the Pink Little Notebook, and Sara from Saige Wisdom) I decided that as this was a spring themed project I would try to do something fun with a used item – a renewal of something old which I thought was appropriate as spring brings a renewal of life (both for plants, and for us unfortunate humans who've been hiding from mean Mother Nature for months). I thought of reworking something I already had but in the end I found the perfect item at Value Village for just $1.99. I've wanted one of these keepsake boxes since I first saw them a few years ago, but as they're priced from $95 to $145 (US) each they are a bit too pricey for my 'tuition-is-expensive' pocketbook. When I saw this wooden box sitting on the shelf at the thrift store I knew what I would do with it. The box had been the recipient (victim?) of someone's artistic touch, but I figured a bit of sanding and some primer and I'd be good to go. Famous last words. 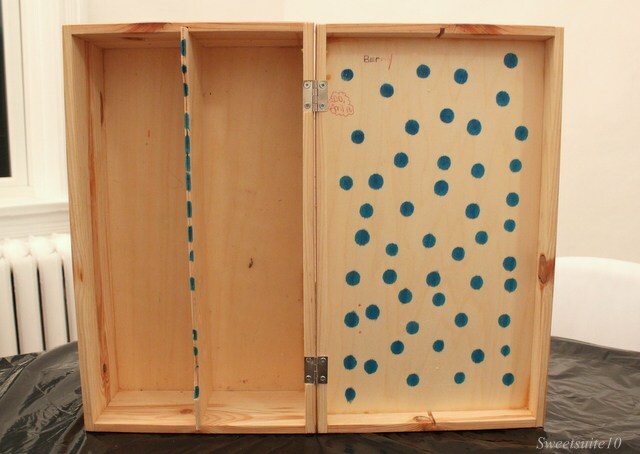 I used Para BlockOut primer which worked wonders on the untreated pine of the box including a couple of knots, but strangely the little blue dots thwarted my efforts to remove them. I have a feeling the only thing that would have blocked the ink was something oil based which I didn't have on hand since it tends to be smelly and I was painting in my dining room. 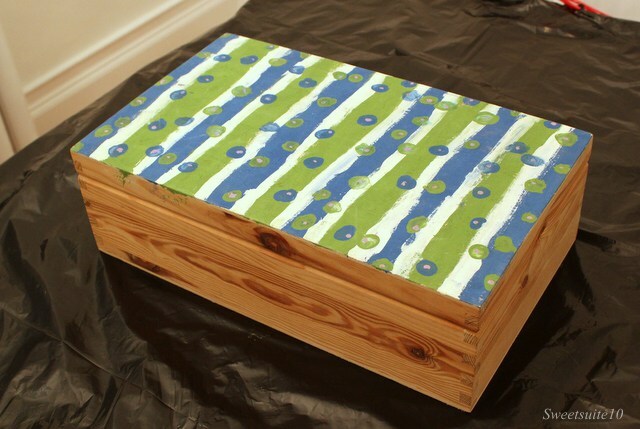 As I planned to use dark paint on the top of the box and the worst of the dots were on the inside of the box (which would rarely be seen), I decided they just add a bit of character to my project. Besides - polka-dots are 'in' right? Once I'd primed the box I added two coats of Jo Jo Whitewash (PF 17), and then it came time to tape off my borders. I debated the size of the borders a bit, but eventually I decided that 1/2" was the perfect size as the box is 14" long. Taping didn't take as long as I thought it might, and once it was completed I used an artist's brush to paint some more Jo Jo Whitewash along the edge of the tape to try to eliminate any colour from seeping underneath. 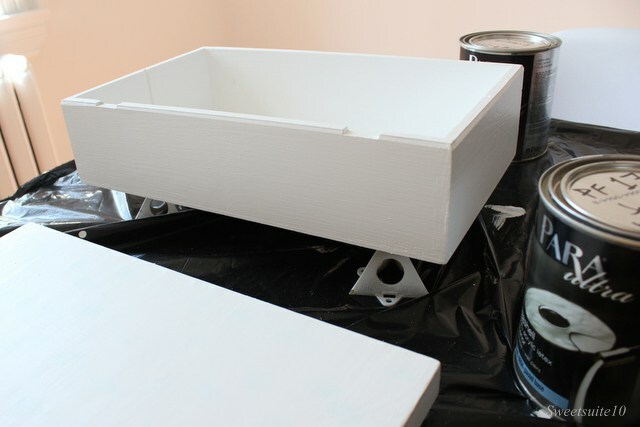 The colour I chose for the box is called Rubber Boots (P5027-73D). I love the colour, but I think it was the name that sold me - can you think of a paint more perfectly named for a spring project? A couple of coats later and it was time to peel of the tape. 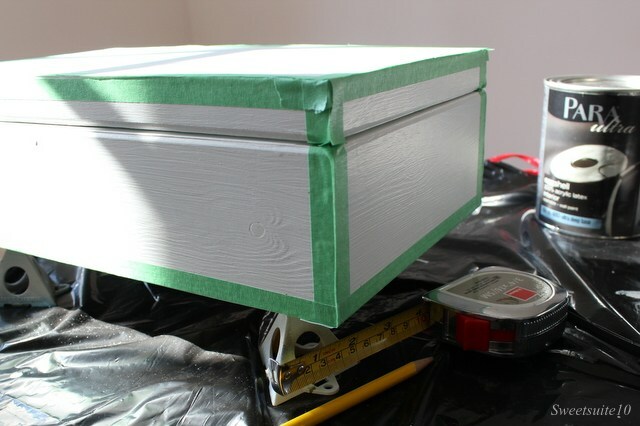 I'll admit to being nervous, and wondered if painting over the tape would make it hard to remove, or worse remove some of the paint entirely, but I had no trouble when I peeled it back slowly, and it revealed a crisp line. I've decided I'm going to store various keepsakes in the box. I've got some 'First Home' cards from when I moved into my condo, some recent birthday cards, pictures of friends and family, and a couple of pieces of jewellery (a bracelet from my Gran, a ring from my great aunt, and a bracelet I got for my first communion) that I don't wear (but want to keep) and I think this will be the perfect place to store them all instead of in a few different places. For now my new keepsake box is sitting beside my TV, but I don't think that will be it's forever home I’ll probably move it to the bookcase, or maybe my bedroom. What do you think? Not bad for a thrift store box right? Now that you’ve seen my spring inspired paint project, I hope you’ll check out what each of the other members of the Para Paints Blog Crew created – click on the banners below. 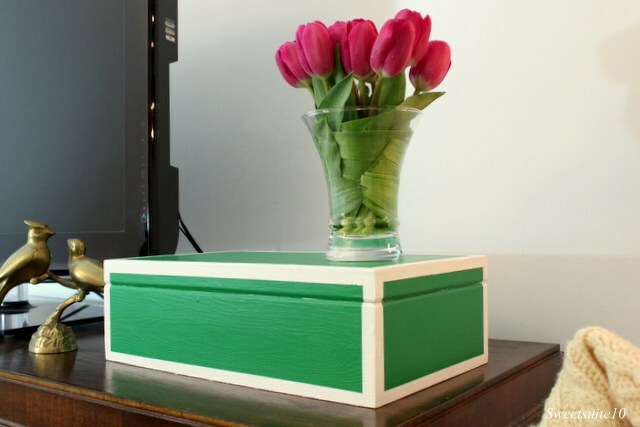 Once you’ve been wowed by their projects I hope you’ll share one of your spring painting projects in the link-up below (You just have to share your project once, and it will appear of each of our blogs). I'm a huge thrifter so I absolutely love a good find! You nailed the colour and detail perfectly. It looks like one of those boxes you see sitting on the shelves of Home Sense. Great job! Lovely Michelle! 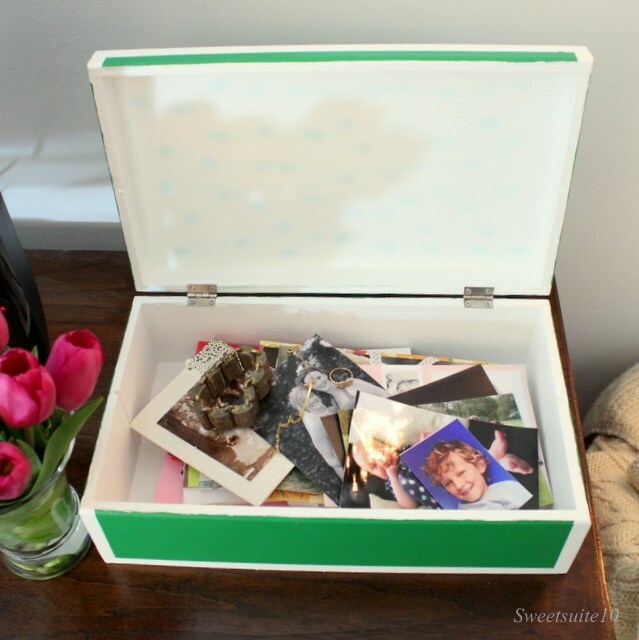 I've been wanting a keepsake box like this to put all of my son's baby stuff in. What a great thrift store find. Glad the painting worked out despite the polka dot fiasco. :) And great choices on the colours as well! That great is awesome! The name is also so perfect for a spring day like today! Your keepsake box turned out so cute. I like the colours you chose - perfect for spring! I looooooove that colour!!!! It's so bold and fresh. Great pick, and great job reviving this thrifted find!